A collection of the first two parts of the popular Japanese action game series that was originally released on PlayStation 2. Both titles have been refreshed and boast an improved graphics design that supports high resolutions. 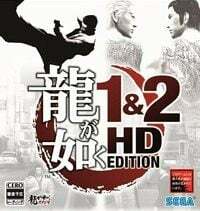 Yakuza 1&2 HD Edition is a set of the first two parts of the popular Yakuza series. She was baptized by gamers and industry journalists as the spiritual successor of the cult Shenmune, published on the Dreamcast console, and also as the Japanese equivalent of Grand Theft Auto. Both games found in the collection debuted in the Land of Cherry Blossom on PlayStation 2 in 2005 and 2006, respectively, also reaching Western markets with a certain delay. Their producer and publisher is SEGA company, which has been successfully expanding the cycle with new releases and side games, such as Yakuza: Dead Souls. The plot of the first and second parts of Yakuza draws on ideas and patterns from the cinema and a gangster novel depicting the backstage of the Japanese mafia. The main character is Kazuma Kiryu, a member of the yakuza who leaves prison after several years of imprisonment. In the wild, he learns that his former friend has fled with the 10 billion yen he stole from the Tojo clan and is being sought by the whole criminal underworld. While he tries to trace the stolen money and the old cameraman, Kazuma unexpectedly has to take care of Haruka, an orphaned 10-year-old daughter of old love. In the second part of the adventure, taking place a year after the events of the only one, Kazuma will face the powerful Omi family and the son of its leader Ryuji Goda. Most of the action of both titles takes place in Kamurocho, a fictional district of Tokyo, full of bars, game rooms, clubs and karaoke outlets. Players also have the opportunity to visit Osaka. The gameplay model hasn't changed at all. The creators decided not to introduce any significant improvements to it. The camera is located behind the hero's back. During the game we take part in dozens of hand-to-hand combat duels, many mini-games and we visit the streets and suspicious city lanes, performing various orders and missions. Manufacturers have significantly rejuvenated the graphic design of both titles, adapting it to support widescreen and high resolution screens. Textures and character models have been improved and enriched with new details. The port also allows for full installation of games, which significantly reduces the time it takes to load levels. The introduction of handling dozens of trophies should satisfy the hunters of virtual achievements.